The Poppelton Building and Harker Building on First near Yamhill. I often try to re-create Portland's first downtown along the river in all its cast-iron splendor. The city's architecture, unique to the entire region in its scope and scale, was the earliest manifestation of Portland's singular essence of place outside of its natural setting. Currently the Architectural Heritage Center is providing a wonderful chance to experience Portland's emergence as a major city with Cast-Iron Portland. The exhibit features fixtures from many of Portland's vanished architectural treasures: the Abington, Smith and Watson, Cooks and first Sherlock buildings, including a golden griffin from the Kamm Block, and an iron wolves head from the Ladd Block, which was torn down overnight in 1965 in a shameful episode after its ownership learned that the PDC recommended the building be preserved. Cast-Iron Portland is not only a story of loss, but of revival. A slide show on a wide-screen monitor features photographs of many of Portland's surviving cast-iron buildings in dilapidated condition before restorations completed over the last forty years. The transformations are stunning and hint at what can be accomplished in the future. The Architectural Heritage Center is open Wednesday through Saturday, 10am to 4:30pm at #701 SE Grand Avenue. 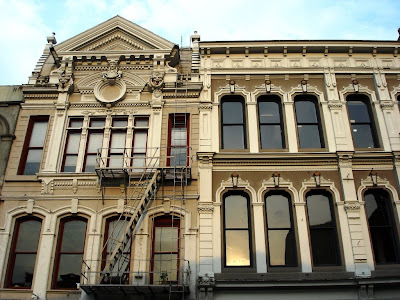 Thanks for this write up on your blog - I am so glad when I find other fellow Portlander's that are aware of Portland back in its "Cast Iron" days, because not many of us are, which is a shame. The first time I found out about it was from the July/Aug. 2008 issue of Portland spaces, and I have lived here for many years. I would love to see Portland back in all of its cast iron splendor also. It's nice to learn more about the history from here. Thank you for sharing!